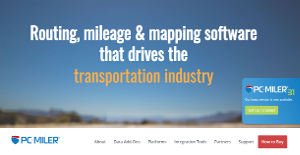 PC*Miler is a commercial truck routing and mileage software specifically built for the transportation industry. It enhances last-mile routing and directions by defining the locations for the entry and exit gates of your truck. Route management content and custom location can be easily created, managed, and shared to empower operational consistency in your fleet. The application aims to help users maximize revenues and reduce costs by providing them with tools to come up with a safe and cost-effective vehicle and shipment routes. PC Miler’s point-to-point routing generates precise mileage results and driving times. Users can input time and cost preferences to figure out the most practical, shortest, or fastest routes, complete with predictive and real-time traffic and weather updates. Users can also boost revenue and manage costs better by comparing route options. Details such as distances, drive durations, and toll costs are carefully taken into account. There is also information on fuel prices. Users can also plan breaks and stop locations more effectively. A product of transportation technology group ALK, PC Miler has real-time traffic updates that help users compute transit times and estimate arrivals. Compliance is also ensured with vehicle and routing profiles intended to keep drivers and vehicles safe on the right roads. Companies can boost revenues and cut down on costs with the help of PC Miler’s safe and cost-effective routing tools. When it comes to truck-specific routing, mileage and vehicle mapping, business heads can be sure that the tools they are using are at par with industry standards. PC Miler integrates effortlessly with top systems for routing and scheduling, transportation and supply chain management, and fuel optimization. Through seamless integration, companies can easily rollout customization and standardization plans throughout their entire organization. With PC Miler, drivers can eliminate out-of-route mileage. This way, users can save valuable time and reduce fuel and toll costs. Drivers can also be more productive while on the road by using a built-in HOS Manager, which factors in breaks and stops into a planned route. PC Miler can be used by virtually any businesses anywhere around the globe as it features Worldwide and Rail map data. Organizations can be more credible and provide better quality service by establishing a PC Miler true cost rating. The software is able to transmit planned routes direct to technicians on the route. This way, business heads can ensure true route compliance. Estimated travel duration and arrival time can also be more accurate with the help of PC Miler’s real-time traffic monitoring. By giving clients or partners more precise schedules, users establish more credibility. If you are considering PC*Miler it may also be a good idea to analyze other subcategories of Best Fleet Management Software gathered in our base of SaaS software reviews. Organizations have unique wants and requirements and no software application can be perfect in such a scenario. It is useless to try to find an ideal off-the-shelf software system that meets all your business wants. The intelligent thing to do would be to adapt the solution for your special needs, employee skill levels, finances, and other aspects. For these reasons, do not hasten and pay for well-publicized trendy solutions. Though these may be widely used, they may not be the perfect fit for your specific wants. Do your homework, check out each short-listed platform in detail, read a few PC*Miler reviews, speak to the maker for explanations, and finally choose the product that presents what you need. How Much Does PC*Miler Cost? PC Miler representatives provide customized quotations for interested buyers, and tailored enterprise pricing licenses starting from $995.00. Contact the company for more details, and ask for your quote. We realize that when you make a decision to buy Fleet Management Software it’s important not only to see how experts evaluate it in their reviews, but also to find out if the real people and companies that buy it are actually satisfied with the product. That’s why we’ve created our behavior-based Customer Satisfaction Algorithm™ that gathers customer reviews, comments and PC*Miler reviews across a wide range of social media sites. The data is then presented in an easy to digest form showing how many people had positive and negative experience with PC*Miler. With that information at hand you should be equipped to make an informed buying decision that you won’t regret. What are PC*Miler pricing details? What integrations are available for PC*Miler? PC Miler integrates effortlessly with services for routing and scheduling, transportation and supply chain management, and fuel optimization. Among them are programs such as ALK Maps and other applications under the ALK parent company. If you need more information about PC*Miler or you simply have a question let us know what you need and we’ll forward your request directly to the vendor.